great grand-daughter of John Daniel Ewens. The cottage known as Chatsworth was built by John Daniel Ewens c1898/99. The residence was located on the main Western Highway just west of Springwood in that area of land now occupied by Buttenshaw Park. 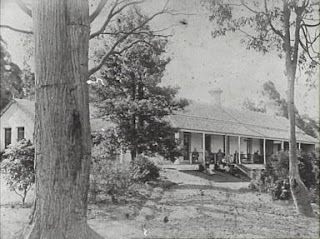 The photograph illustrates that it was a substantial home with wide front and side verandahs. Unfortunately, the house burnt down in 1908. Not a great deal is known about the origins of John Daniel Ewens, however, a birth which appeared in the registers of St Martins in the Field Middlesex England in 1838 for John Daniel Ewens, may have referred to this gentleman. In 1871, when Ewens was fined for non-attendance of jury duty, his occupation was listed as writing clerk. In 1874 he was elected as auditor for Petersham borough and eleven years later, he was elected at auditor for Ashfield. Ewens was the assistant Council clerk for Newtown for a period of two years until resigning in 1876. During this time his occupation was variously listed as accountant and boot manufacturer. He is known to have been involved with several other gentlemen in the Esperance Gold Mining Company which was wound up in 1875. In 1884, he appeared before Hon. James Martin Justice of the Supreme Court and T.W. Garrett (LS). He and Alfred Tompsitt (Ewens & Tompsitt boot importers) were appealing for the proceeds of a deceased estate for monies owing to their company. In 1886 the Rev. J.C. Corlette assisted by Rev Canon Kemmis vicar of St Mark’s Church Darling Point officiated at the marriage of Henry John Noble of Sydney to Ruth Eunice second daughter of Mr and Mrs John Daniel Ewens of Montrose Ashfield. Noble was the elder brother of Montague Alfred Noble (1873-1940) who had a brilliant cricketing career. His nick-name was Mary Ann and he captained Australia in 15 test matches. The Ewens family were still in possession of Chatsworth until 1905 when a Mrs Wheeler took over the rental of the property to run as a boarding house. It would seem that Mrs. Wheeler may have purchased the property from Ewens in 1906. Unfortunately, a house fire destroyed the residence in less than two hours, in 1908, despite the best efforts of local residents. A local newspaper report at the time stated that the stone walls were all that was left of Chatsworth. A 1907 tourist guide suggested that the establishment of Mrs. Maude Wheeler never failed to attract attention nestling, as it did, in a cluster of old trees and neatly kept gardens. Tennis courts, a large playground, a croquet lawn and orchards completed the pleasant ‘home-like picture.’ Chatsworth, the guide stated, served an excellent cuisine, and its airy bedrooms added to the other appointments which were all first-class. In a short time Mrs. Wheeler had gained the reputation of being a most cheerful and obliging hostess. Fortunately the house was insured with Australian Mutual Fire Society for about £1100. Sydney Morning Herald 9.2.1874 & 7.2.1885. Newtown Project, http://www.sydneyarchives.info, Mr. John Daniel Ewens, accessed June 2011. Sydney Morning Herald, 21.8.1875, p. 10.